In what I believe is the first large order for concentrator modules, Silicon Valley Solar, Santa Clara, CA, has received a $35 million order for 10MW of Sol-X2 solar panels from Pacific Power Management of Auburn, California, a solar system integrator. Shipments will begin in the first quarter of 2008, with a linear delivery schedule over a three year period. SV Solar's Sol-X2 products are high efficiency, low cost flat plate modules utilizing a unique "internal" concentrator. 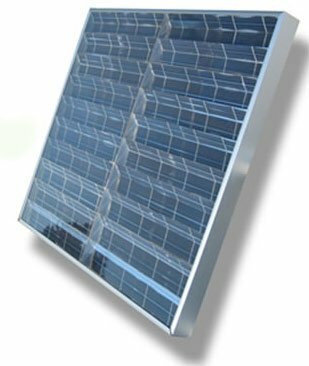 The modules require less than half the number of solar cells when compared to traditional solar modules, while producing equivalent or even higher power output. This reduces cost while enabling higher volume production given a fixed supply of silicon. Solar cells currently account for up to 75% of the total module cost, and with the current shortage of refined silicon, are a limiting factor on the total production of solar modules. The modules are dimensionally and electrically equivalent to standard flat plate modules without the need for a complex tracking mechanism. The "compatible" form-factor of these modules enables traditional installation, and the lack of moving parts provides the long-term reliability the solar industry demands. This appears to be an application of 'non-imaging optics', a technique that enables modest concentration (factor of 2) to be achieved without tracking (this doesn't violate the 2nd law of thermodynamics because sunlight is guaranteed not to be coming from below the module). Non-imaging optics, unlike high concentration optics, can also fully utilize diffuse sunlight, which is important in regions like the US southeast where much of the insolation is diffuse. However this sort of thing has just got to become cheaper if it is to really take off. A solar plant to replace a coal or nuclear plant would cost $29 Billion, and its power would cost $390 per megawatt hr. A long way from being practical. WFH: today's PV is clearly too expensive to replace conventional baseload supplies, even ignoring the cost of storage. The hope is that as the PV market continues to expand, serving ever-larger niches, the cost will continue to decline. The 'learning rate' for PV has been a 20% reduction in cost per doubling of cumulative production (of modules). Optimistically projecting this into the future, a factor of 1000 increase in cumulative production will reduce costs by a factor of 10. This would make PV very competitive, particularly for distributed users and daytime peak loads. Coal and nuclear are already well down their experience curves, so we can't expect nearly as large a reduction in their costs from this effect. Are you taking into account the fact that raw material delivery, as well as waste product storage/hauling/disposal, with solar power, is cost-free? Not so with coal-fired/nuclear. Not to mention environmental degradation. WFH: What backs up these numbers? The story tells of modules at $3.50/Wpk. Over a 25 year life, each Wpk generates at least 35 KWh, which corresponds to $0.10/KWhr, well under the retail cost of electricity. The most important thing this ignores is the discount rate, ie the cost of paying up front. If you set that at 5% or so, you get your number, $0.39/KWh. And yes, that's a lot more than coal. But do you really know what the cost of coal and nuclear fuel will be 15 and 25 years from now? The certainty of solar's future cost is worth something! And as others have already pointed out, the cost trends are going in the right direction. Paul, if you read my paper you know my recommendation is to increase R@D for non fossil energy sources from $2.07 per person to $200.00 per person, about $60 billion per year. Solar research would go up about two orders of magnitude. If it becomes practical, great, it is too early to be picking winners and losers. We have yet to build the Model T of nuclear power plants, there is enormous room for improvement. Garsky, There are many options for nuclear waste, it is not a difficult engineering problem, we just have not selected one. My preference is described in the paper. The nuclear power industry contributes $1.00 per mWh to a government held fund to dispose of nuclear waste. The industry has paid in $24.8 billion, of which $6.6 billion has been spent, very inefficiently, to study a dry land repository. Solar cells contain highly carcinogenic cadmium, half life infinity, will their disposal be done as carefully? Enertechie The source of the numbers can be found in the spread sheet with the paper, in this case the DOE. My calculations used $2.93 per watt as reported by the DOE. At that price the solar cells to replace one nuclear plant would be $18 billion, which would have to be paid up front, vs. about $3 billion for a nuclear plant that lasts twice as long. CdTe cells do. Si and CI(G)S cells don't. I'd worry more about all the Cd that contaminates phosphate fertilizers. Some phosphate deposits are up to 100 ppm Cd. Does anyone know about the principals in this new SV Solar company? Are they trustable, honest? I don't know anything about the principal owners, but someone's entered into a major contract with them I assume they've done their research. Like Paul said, this is physically possible. 1. Your analysis of solar is based on use in N. USA and need for storage. Current price viable market is remote off-grid applications. Next price viable market in USA is peak power replacement in sunbelt. More sun. No storage. Your analysis way off mark relative to this. 2. Inifinite supply of uranium from sea water. Quite a claim to make without offering an economic analysis of this, especially given your solar analysis. This is very out-of-balance. 3. Biofuel will only be competing with food in the short term. We are already starting to convert to cellulosic ethanol in the sense that plants for this are now being built. PHEVs and EVs will reduce the amount of this that is needed. Ultimately biofuel will be used for industrial processes, not transportation. 4. The USA has huge wind power resources. Yes, in the plains states. Every little bit helps. Washington, Oregon, and Califoria have good resources that may be closer to populations. You totally ignore up and coming wave and tidal sources. 5. As Paul Dietz points out your above criticism of solar's use of Cd is way off. Most current PV is silicon based, with the next big player emerging as CIGS/CIS thinfilm. I have a file with over two dozen new tech PV companies listed and only one is using CdTe. First Solar is including the cost to recycle their panels in the price. Very few companies are using CdTe, because of the Cd. Get yourself educated on this. 1. Our last build-up of Nuclear plants was plagued by industrial greed. Each company had to have it's own design and this led to huge recuring certification costs. Solar will not have this problem because of its' distributed nature. This is a huge competetive advantage. 2. Storage of nuclear waste. It does not matter if this a political problem, instead of a technical problem. The political NIMBYism thing makes it a problem that needs a solution. 3. Public perception of safety. Safe nuclear power can be accomplished. The US Navy has a great track record. The US industry has a blimished one. Public perception is important here. Private sector competition does not always encorage the safest designs. Government over-sight can be costly and problematic as well. Who's going to untangle all this and make it work properly? ...cost effectively? So we, the tax payers, don't have to pick up another mess. I do like your idea of increase tax and spend for energy development, but I would spend most of this on tax incentives that let industry sort out the best players. A lot of R&D has been done since the 70s that we could use right now. We need a balanced energy portfolio in this country. Hopefully with transition away from exhaustable energy supplies, with new tech nuclear as reliable backup for situations of geologic instability or thermo-nuclear war. Please build us a reliably high-energy fission reactor, or solve the fussion problem. I'm all for it. Solar power (PV, thermal, wind, wave, OTEC, etc.) is a mature technology. The solar mining machinery could be free, and the cost would still not be competitive. Solar insolation reaching the earth's surface only averages six to ten thousand times the average total plant-wide anthropomorphic power use. At a rate of increase of the latter of 3%/year, that gap would be closed in only 300 years. Based on this, it might be said that solar is not capable of providing power for evolving cultures. Nuclear fission, on the other hand, is capable of providing power beyond that average level of solar insolation. Not true, calculations use average performance figures from DOE for US solar installations which are concentrated in locations with excellent solar conditions. New Mexico just had two large snow storms in two weeks, each with more than two days of bad weather. Some northern climates have much longer periods of bad weather. The potential markets you list represent a small fraction of total energy consumption. We need massive amounts of continuous clean power to stop building coal and gas plants and to dismantle existing plants. The estimated cost of sea water uranium has dropped from $7,000/ pound in the 70’s to $300/ pound based on research in Japan, the links are in the spreadsheet. Uranium and thorium are rather abundant materials and the amount we need is tiny, 0.723 pounds per year per person with first generation reactors and 0.005 pound/year with breeders. A year’s supply of coal (14,200 lb) costs $218. The matching price for uranium would be $300/pound with first generation reactors and $46,000/pound with breeders. The comparable uranium prices for natural gas are $1,200/lb and $180,000/lb. We will not need sea water uranium for a long time, if ever, so it is not being pushed, just an example. How many cellulosic plants are in operation? Where can I find their performance history? If we process the entire corn (or switchgrass, etc) plant our topsoil will be depleted even faster than the current unsustainable rate. New ethanol plants are being designed to use coal for process heat, is this progress? We will run out of topsoil long before we put a dent in the world’s supply of uranium, lets not accelerate the process for energy. It is amazing how people can compare theoretical idealized future wind solar and ethanol technology with reactor designs from the 1960’s and call it fair and balanced. How many new reactor designs has the DOE tested since the Ford administration? Even so, the nod goes to nuclear if we ever get serious about closing coal power plants. Denmark has ideal conditions for wind, and after pushing wind very hard with massive subsidies for 30 years they lead the world with only 139 watts of wind power per person and pay $297 per megawatt hour. The US uses 1,550 watts per person and pays $94/mWh. Wind, wave tidal and solar are expensive niche intermittent sources, we need massive sources of continuous power. That said I support R&D for all of these until they are proven practical or impractical. If we take the emotions out of the argument, Cd is not a big problem, and neither are fission products. If solar cells were free they would only be able to supply a modest fraction of our electricity, a very small fraction of total energy, because of the storage problem. You need very cheap solar cells and very cheap energy storage to have a big impact. I do not think those two things will be available soon. I AM ACTUALLY FAR FROM APPOSED TO NUCLEAR. I THINK IT SHOULD BE PART OF OUR NATIONAL ENERGY STRATEGY. WE DO NEED TO DEVELOP, AND PROVE OUT AS RELIABLE, HIGH ENERGY REACTORS THAT USE NUCLEAR FUEL MORE EFFICIENTLY. THIS WOULD RADICALLY REDUCE THE NUCLEAR WASTE PROBLEM. IT IS MY UNDERSTANDING THAT THESE DESIGNS ARE NOT YET PROVEN AND THIS WILL BE A PROBLEM FOR THE NUCLEAR INDUSTRY. If all our electricity came from fission an 80 year lifespan would produce 5.4 ounces of fission products, of which less than one ounce would still be radioactive at end of life. That is true for first generation and advanced designs, although higher thermal efficiency may reduce that. Spent fuel should be recycled to make use of the many atoms not split in the first pass. Next generation reactors are a modest evolution of current designs incorporating the lessons learned. Modern plants have been completed in Japan, China, France and elsewhere, they are performing well. 1. OUR LAST BUILD-UP OF NUCLEAR PLANTS WAS PLAGUED BY INDUSTRIAL GREED. EACH COMPANY HAD TO HAVE IT'S OWN DESIGN AND THIS LED TO HUGE RECURRING CERTIFICATION COSTS. SOLAR WILL NOT HAVE THIS PROBLEM BECAUSE OF ITS' DISTRIBUTED NATURE. THIS IS A HUGE COMPETETIVE ADVANTAGE. Would we be better off with a one design car, airliner, solar cell, and windmill. Competition helps evolve the technology. We have yet to build the Model T of nuclear power plants. If the government treated the car industry the same as nuclear power, you could buy a very well analyzed 1957 Ford Crown Victoria for about $100,000. Would you be safer? There are many solutions, we should implement one. My recommendation in the paper is to put it in nobody’s back yard. The routine emissions from coal burning power plants kill over 20,000 people each year and cause millions of non fatal health problems in the US alone, and mercury from those plants damages the brains of newborn children all over the world. If we did not have 103 reactors generating 20% of our electricity we would have 103 more fossil fuel plants, mostly coal, generating that power, taking another 4,000 to 5,000 lives each year. How many first generation technologies can you name with this much benefit? A tax on emissions that accurately reflects their true cost would make non fossil sources much more attractive, and would pay for the needed R&D. The nuclear regulatory Commission budget is covered by user fees. The utility paid for the TMI cleanup. PLEASE BUILD US A RELIABLY HIGH-ENERGY FISSION REACTOR. OK, I read it, here are a few excerpts. WE CAN HAVE ELECTRIC HOT WATER HEATERS JUST AS EASILY AS GAS HOT WATER HEATERS. WE CAN HAVE ELECTRIC HOME HEATING. Actually people who go off the grid have to reduce electric consumption drastically by switching high energy applications to gas or propane. IT'S NOT JUST THAT WE'RE MOVING TOWARD ALTERNATIVES, IT'S THAT WE'RE MOVING TOWARD DISTRIBUTED [POWER GENERATION] AS WELL. IF BOTH OF THOSE ARE TRUE, SOLAR IS THE ONLY VIABLE OPTION. SOLAR IS DIFFERENT FROM OTHER ENERGY TECHNOLOGIES IN THAT IT DELIVERS ENERGY AT THE POINT OF USE, DIRECTLY TO THE END USER. THAT ALLOWS IT TO CIRCUMVENT THE ENTIRE SUPPLY CHAIN. In one sentence solar is our only viable solution and in another it is a small percentage of our total energy source, which is it? So, Denmark takes 30 years to get to 140 watts per person of wind, but wind and geothermal are going to pick up 1,000 watts of baseload plus several thousand watts of new electric transportation and industrial load, I don’t think so. New wind farms in Colorado are limited by the lack of transmission line capacity. His vision will require a massive grid to wheel power from areas with sun and wind to those without. What about the areas where wind and geothermal are not available or not wanted? ITS LIMITS ARE NOT A PROBLEM WE'RE GOING TO HAVE TO DEAL WITH FOR AT LEAST TWO OR THREE DECADES. BY THE TIME WE REACH A POINT WHERE SOLAR'S PROBLEMS MIGHT BE BINDING, WE'LL ALREADY HAVE A SET OF OPTIONS TO DEAL WITH THEM -- STORAGE SOLUTIONS WILL BE THREE DECADES AHEAD. BY THAT TIME WE'RE GENERATING A QUARTER OF OUR ENERGY ON SOLAR ANYWAY. Wow, 25% solar in 30 years if everything works out perfectly. What am I worried about, time to kick back and relax. Some people were asking questions about the integrity of some of the parties involved in the SSV/Pacific Power Management/GSS contract situation. I have no idea about SSV or GSS but I can offer you some background on one of the principals of Pacific Power Management - Mark Frederick. you will see the video shown by us before a Placer County jury last year in a successful fraud case brought by us against him and his wife. The Court awarded us on three counts of fraud and involved the fire damage you see plus an engineering report which was both concealed and also not followed. From 10 to 15 June, SolarPlaza, in cooperation with the California Solar Energy Industries Association (CALSEIA), is organizing its 6th international PV trade mission. Here you will be able to learn more about the Californian PV market and visit ambitious manufacturers (like MiaSolé and Applied Materials) in the “Solar Silicon Valley” region working on next-generation solar technologies. This event will bring together PV business executives and investors from many different countries, creating a dynamic environment and a platform for high-level discussions. Both the intensive formal and the enjoyable informal programs have been proven to provide opportunities to build intensive contacts and new business with the other delegates involved. "Wow, 25% solar in 30 years if everything works out perfectly. What am I worried about, time to kick back and relax." 1. Solar is not the only non-nuclear alternative energy source. 2. Nuclear as the dominant energy source in the USA is very unlikely in a 30 year timeframe, even with the massive financial support you suggest.